The body functions as an interconnected unit. Many bones, joints, muscles and tissues work together just to do a basic squat, or reach to answer the phone, or type on a computer. Each part affects the other parts, and it’s important to recognize that addressing the entire biomechanical chain, rather than just one problem area, is the key. Here are some basics regarding human movement, and the way we address it. The body communicates as a series of parts that work together. To put it simply, the foot tells the knee where to go, which tells the hip what to do, which transmits forces through the spine, and up to the shoulders, neck, and head. Each area contains many muscles that work together to control and affect the surrounding areas. For example, the foot has almost 100 muscles that either connect directly to it or directly influence it in some way. Several of these muscles connect not only to the foot itself, but run all the way up the lower leg and also connect to the knee. If one of these muscles is off, it can affect the foot, the knee, and more. Similarly, if the hip is off, the spine can’t transfer force and the person may be subject to a potential shoulder injury or neck tension. Where Do Movement Dysfunctions Come From? Our body is composed of muscles, bones, joints and soft tissue that all work together as one complex machine. When muscles and tissues are “stuck” the nervous system does not receive the necessary input to make the best motor control decision. The tricky thing is, you may have no idea that your movement pattern is less than ideal. That is until you have sprained the same ankle time after time. Repetitive ankle sprains are very common due to decreased ankle proprioception. Because the connective tissue is unhealthy the ankle is not able to tell the hip how to best stabilize the leg. Establishing a regular mobility program based on your individual movement dysfunctions is the best way to address this abnormal break down, and potential injury, associated with movement. 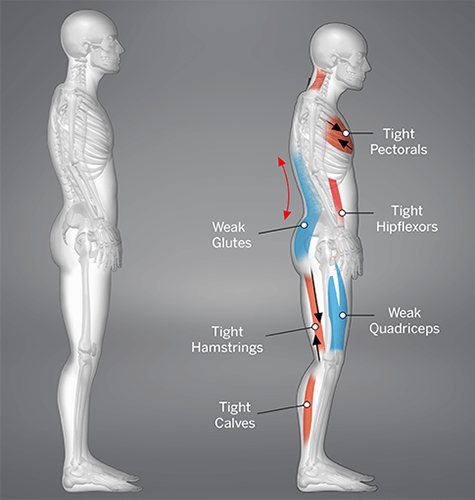 Muscle imbalances are one of the more common contributors to pain, but are often overlooked. The body is made to be balanced. When someone has proper biomechanics, the muscles on the front of the body balance those in the back, the muscles on the right side balance those on the left, and the muscles on the bottom balance those on the top. If there is not balance in the body, then there is a muscle or muscle group that is doing far more than it was designed to do. When these muscles become overloaded, it could result in the muscular strain (as was addressed earlier) or the muscle can become chronically tense or tight. Our bodies were built to move. It's that simple. Unfortunately for many of us, a good portion of our daily lives involve sitting at a desk, hunched over a computer or other sedentary and repetitive postures. This sedentary lifestyle can inflict many health issues. A chronically tense muscle can pull a joint out of proper alignment and result in other tissues becoming compressed. For example, a common problem in the lower body is known as Piriformis Syndrome. This is when a muscle in the hip known as the piriformis becomes tense and compresses the large sciatic nerve. This nerve runs from the low back all the way down to the foot and generally the pain is felt in the glutes or upper leg but can sometimes be felt down the back line as far away as the foot. This pain is usually the result of the muscle imbalance in the hips and the piriformis becoming "stuck" to the surrounding muscle. While this is the case for many people it is beneficial to speak with your doctor before simply assuming it is a muscle imbalance issue.